weBoost Home 4G Cellular Signal Booster amplifies 4G, 3G, voice and data providing you with strong reliable cellular signal for all of your cellular devices. Designed to give the best results when used in a small area, such as desk and workspace, the weBoost Home 4G Cellular Signal Booster significantly improves your cell phone or data device's overall performance by minimizing dropped calls, increasing signal strength and data rates, and letting you enjoy clearer reception. 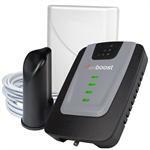 The weBoost Home 4G supports multiple cell phones and data devices simultaneously, and works with all major North American cell phone carriers. You'll experience fewer dropped calls, faster data rates, and clearer reception with the Home 4G.